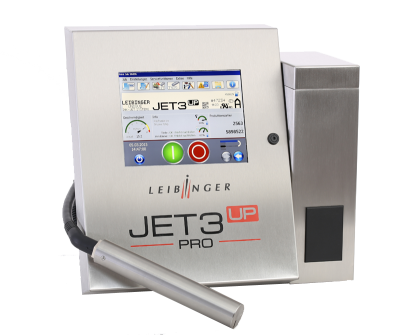 Jet 3up PRO – Leibinger – Innovative Marking Systems, Inc. Helping Companies Make Their Mark One At A Time! Industrial printers are used in a wide variety of areas. Many people are familiar with expiration dates on foods and beverages. These are produced under stringent hygiene regulations. All machines are cleaned daily and sprayed off with water—even the industrial inkjet printers. Therefore, Paul LEIBINGER developed the JET3up PRO with an IP 65 protection class, which means that it can be used in these types of harsh production environments. This extremely resistant industrial printer comes in a highly durable stainless steel cabinet that protects against dust and spray water. Typical examples of application for the JET3up PRO include printing on cans, plastic and glass bottles as well as packaging for cheese, meats and sausage and many other products from the food and beverage industry. The JET3up PRO has also proven itself in the construction material, medical technology and pharmaceutical industries. One example of this is the serialization of medications. © 2017. Innovative Marking Systems, Inc.